The NEC or the National Exhibition Centre is part of the NEC Group Birmingham. This includes The NEC, The ICC, The NIA and the LG Arena. 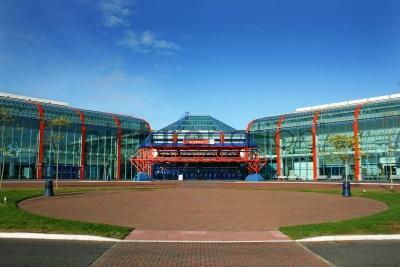 The NEC is the busiest exhibition centre in Europe, staging around 160 trade and consumer exhibitions each year. It is also one of the biggest with 21 halls totaling 200,000sqm of exhibition space on a 650-acre site. The NEC is well known for large international trade shows and exhibitions, but they also host smaller fairs and trade shows. The NEC is in a great location in the heart of UK in Birmingham. It is situated adjacent to Birmingham International Rail Station and Birmingham International Airport is also close by. The NEC has large exhibition halls for international events and small hospitality suites. POD Exhibition Systems have been supplying modular exhibition stands for exhibitors at the NEC for over 10 years. Whether you have rented floor space only or a shell scheme at the NEC, we can supply a custom exhibition stand with quality graphics for your event at the NEC. We also regularly attend the NEC as a supplier of exhibition hire furniture. For more information on exhibition design ideas, digital signage on your stand and all portable exhibition equipment, please call our sales team on 01933 411159.